Visual Systems Sales Ltd specialises in the design, installation and after care of professional Audio Visual Systems. 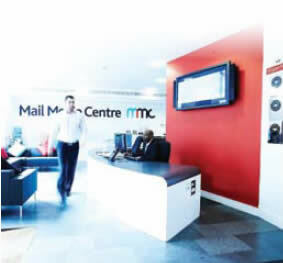 Specialising in direct mail, the Mail Media Centre is a new source of intelligence and innovation for the direct mail industry – brought to you by Royal Mail. Through showcasing compelling creative and offering expert advice, we want to inspire excellence in direct mail. [The] System has been welcomed by visitors who can see information about the site and service on the reception area screen while waiting in reception area. Ray Sappal, Director, Visual Systems Sales Ltd.
[The] client is over the moon with the system and installation, even more impressed by how simple the system is to use. Challenge: Royal Mail’s Mail Media Centre (MMC) wanted a digital signage solution that could be integrated into their existing installation as they were looking to modernise communications in the reception and the client resource area. Solution: Optoma D5000 advanced media player with all upgrades included as standard and no ongoing licence subscription fees. 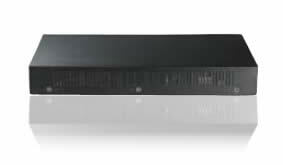 The Optoma D5000 was also the only solution that could easily be integrated into the MMC’s existing installation. Results: MMC’s reception and client resource area has been transformed with the addition of the new communication system. The D5000 has enabled MMC to update their customers easily. August 2009, Royal Mail was looking for signage solution to be installed at their Mail Media Centre (MMC) based in Stukeley Street, London. The MMC sought to modernise communications through the welcome screen in the reception area and to drive the client resource area to promote in-house services. The brief was for a user friendly, easy to use and update signage system. Visual Systems Sales Ltd was commissioned by Royal Mail to provide this solution. Prior to the Optoma D5000 install, MMC’s reception area simply consisted of two plasma screens being driven by either a TV signal or DVD Player. The MMC were looking for a digital signage solution that was eye catching and that could provide visitor’s with information as well as useful points about the centre. They were also looking to include the same information and images across two screens within the centre itself and in the main reception area. Visual Systems Sales Ltd approached Optoma for this project as “[the] client wanted a cost effective solution and a single monitor system with no monthly charges”. Ray Sappal, Technical Director, Visual Systems Sales Ltd. The MMC already had two 50” plasma screens installed that were being driven by either the TV or DVD player. The MMC wanted to utilise the screens to their full potential: “We looked for a solution that could be easily and instantly updated or managed without any real fuss.” Ray Sappal, Technical Director, Visual Systems Sales Ltd. The installation company, Visual Systems Sales Ltd compared the Optoma offering to other similar solutions and found the low cost of ownership over a 3 to 5 year period made the Optoma D5000 an obvious choice. With all upgrades included as standard, the full suite of software and no ongoing licence subscription fees the choice quickly became an easy one. The Optoma D5000 was also the only solution that could easily be integrated into the MMC’s existing installation. In addition, the D5000’s content creation software is user licence free, intuitive and all training was included free of charge. The installation was quick and easy, involving only one engineer to complete all of the work: “[It took only] one day to install and test, [and was] low cost on cabling.” Ray Sappal, Technical Director, Visual Systems Sales Ltd. To ensure the client (MMC) was happy and the installation was a success, the Optoma digital signage specialist was made available on site to check the equipment had the latest firmware and to provide end user training. Following the installation, MMC’s reception and client resource area has been transformed with the addition of the new communication system. The D5000 has enabled MMC to update their customers easily: “[MMC] can change templates instantly and update information quickly.” Ray Sappal, Technical Director, Visual Systems Sales Ltd. Furthermore, Optoma also provided MMC with some complementary, pre-made templates to get them started with the D5000 software. Optoma D5000 Bundle, 50 inch plasma screen and local PC including PC splitter to allow for second screen to be attached to system.